In 1991, had we been given the opportunity to join the Ghostbusters as an “Experimental Equipment Technician,” we probably would have jumped at the chance. It’s a job that would prove to be extremely dangerous -- it would involve not only battling demons and ghosts, but doing so with untested and potentially dangerous equipment. But in 1991, we were young and careless. In 2009, we're (mostly) responsible adults, and -- despite the fact that most of us are scared to leave the house in thunderstorms -- our dreams of strapping on a proton pack and taking out Gozer and associated spooks and demons never quite faded. Thanks to developer Terminal Reality, Ghostbusters: The Videogame allows players to hop into the shoes of a ghostbusting rookie, a fifth wheel on the established team. Yes, Ghostbusters: The Videogame features the film cast you’ve come to know and love, in both voice and looks. Taking place soon after the events of 1989’s Ghostbusters 2, Ghostbusters: The Videogame is as close to a true sequel as we’re going to get until the “forever in development hell” Ghostbusters 3 film gets off the ground. With Harold Ramis and Dan Aykroyd responsible for the script, and the most essential folks from the original cast on board, Ghostbusters: The Videogame could be exactly what fans have been clamoring for. But is the game any good? Nick, Conrad, and Anthony (almost a full Ghostbusters team!) get to ghostbusting business, after the jump. 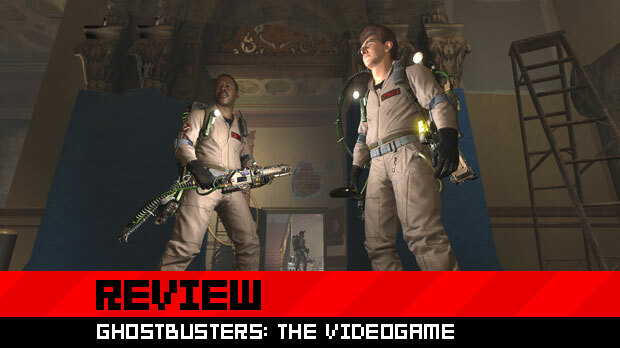 As the “in theory” third installment to the film series, Ghostbusters: The Video Game hits all the right notes. From the start, fans will recognize the cast, all of which have been digitally re-rendered and frozen somewhere in the late '80s, from Bill Murray as Peter Venkman to Annie Potts as receptionist Janine Melnitz. The game’s cut-scenes, both in-game and pre-rendered, are visually impressive, and directed in such a way that’s consistent with the quality and feel of the films. 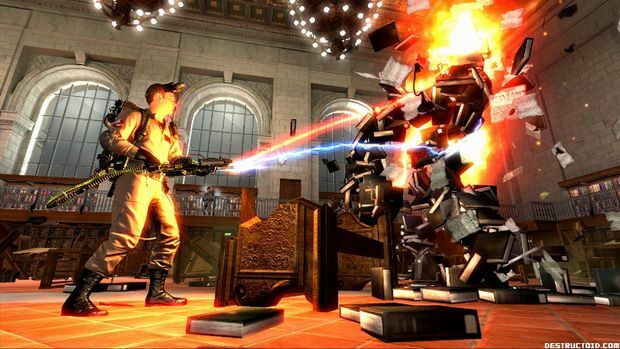 You can tell from the opening scenes that Ghostbusters: The Video Game was designed by a team of true fans with passion for the original material. 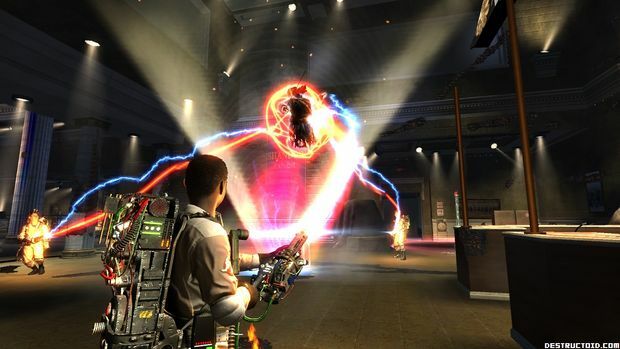 The game is littered with nods and fan service for Ghostbusters die-hards, from characters and event references, to hyper-detailed equipment such as the Proton Pack you’ll be staring at for most of the game, complete with accurate flashing light, wiring, and tubes. The story and dialogue, straight from the mind of original screenwriters Ramis and Aykroyd, is mostly on par with the classic films. I say mostly because while it holds its own in many ways (expanding upon the established film lore in a number of ways, for instance), it doesn’t quite have all of the charms of the original. The script is witty and oftentimes laugh-out-loud funny, but few of the lines resonate or are as unforgettable as those found in the films. Hell, just yesterday I used the words “Human sacrifice, dogs and cats living together... mass hysteria!” (a line from the 1984 original) in casual conversation. The game also doesn’t introduce any new characters you’ll really remember, either. This makes sense for the player’s “rookie” character who remains nameless (and mostly voiceless, outside of a few grunts here and there); but again, this makes sense -- he’s you, and the game benefits by not assigning a real voice to the player. But Peter Venkman’s new “love interest,” Illyssa Selwin (voiced by Alyssa Milano) is wholly unremarkable in just about every way. Not even my personal childhood Milano crush could save the character from the flat, phoned-in dialogue the actress delivered. With all of that said, the story and cut-scenes are certainly some of the most enjoyable things about Ghostbusters: The Video Game. After all, even if the material doesn’t stand toe-to-toe across the board with the originals, it’s better than no new material at all. If anything, it proves that Ramis and Aykroyd definitely still have “it,” that they’re capable of delivering a genuinely humorous and enjoyable narrative. So yeah, Terminal Reality got the “Ghostbusters” part down. Fortunately, the third-person action does do a pretty amazing job of putting you in the Ghostbusters' classic tan overalls. The ghost wrangling mechanic -- which involves capturing, slamming until subdued, and then maneuvering a ghost into a trap -- definitely feels a bit unwieldy at first. But with practice and understanding, the battle for the capture is both challenging and rewarding -- you actually "feel" as if you were a working, card-carrying 'buster. As the experimental equipment tester, you’ll be outfitting your existing Proton Pack with some major upgrades. All of the upgrades and different streams come into play in various ways throughout the game, but some are clearly more useful than others. The Statis Stream, for example, “emits a high-capacity stream of order-reversed particles that hypobond to ectoplasmic matter, effectively immobilizing ghosts.” Run through the “Egon Spengler to English” translator, that means it acts as a “freeze ray.” It’s great in theory, a neat take on the traditional Ghostbusters equipment, and it’s useful in a few situations. But it’s a weapon I found that I almost never had to use to complete any of my objectives. Other equipment -- like the Slime Blower and Slime Tether -- had far more uses, occasionally used in light puzzle solving situations. The Tether, in particular, comes into play more than a few times throughout your Ghostbuster career, allowing you to join a variety of environmental objects to one another, which lets you to open gates or even create new pathways. The different equipment and its numerous uses was a bit of a surprise, adding much-needed variety to a game that could have simply had players going from room to room wrangling and then drunking ghosts in traps. From a visual standpoint, Terminal Reality’s Infernal Engine can do some marvelous things -- above all with its lighting effects -- and it shows all over the game. The streams that blast from the Ghostbusters' equipment light up the environment with colors, casting some wild neon lighting effects that explode on-screen. Ghostbusters' ghostly icon, Slimer, emits a green glow that casts light on everything in its path. The lighting magic is impressive throughout the game, particularly towards the game’s end, with some extremely neat and stylized rain and lightning effects. Ghostbusters: The Video Game, for everything it does right, is not without its fair share of frustrating issues. Particularly, the game’s controls sometimes make your character feel clumsy and slow, particularly when you take a spill. Once grounded, one of two things will happen. If you’re incapacitated, you’ll be left helpless on your back waiting for the game’s AI to run over and rescue you. Depending on the situation, you can be waiting for either one or four Ghostbusters to come revive you, and sometimes the wait can be excruciating. In some of these cases, a long wait will end in one of your A.I. comrades dying before they can revive you, resulting in a “Mission Failed.” In other frustrating cases, your character is sent flying through the air like a rag-doll, and he’ll slowly bring himself to his feet. Another issue is frequently confusing level design, where it’s sometimes easy to get lost with no on-screen map or indicator of your next objective. This is made even more frustrating in many instances as you’ll sometimes have to wait for the non-player character Ghostbusters to make a move or decision before you can proceed. There’s no indication that this is happening, either -- the uncomfortable and awkward silences and “okay, now what?” moments are, well... uncomfortable and awkard. Ghostbusters: The Video Game also didn’t ship without its fair share of minor, but frustrating, bugs. While it only happened a few times, there were instances where ghosts were trapped in the game environment in such a way that they couldn’t be captured. Because of this, I was forced to reload the last checkpoint, the frequency of which actually saved my sanity a few times. The single-player “career” can be completed within a few dedicated sittings (Anthony, for instance, claims to have completed it in one), and if you’re paying attention, you can probably find most of the hidden objects and upgrade most of your equipment in one sitting. So while there’s not much game, it’s fortunate that it’s enjoyable enough -- particularly for a Ghostbusters fan -- to work your way through to the end. 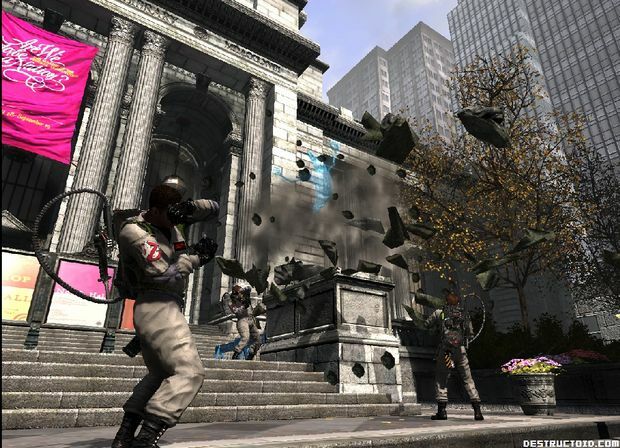 Ghostbusters: The Video Game also features a multiplayer mode. You could assume it would be a throwaway extra, but you’d be wrong. It’s definitely disappointing that you can’t play the career mode from beginning to end with buddies, but the cooperative multiplayer instanced modes are a reasonable substitute. 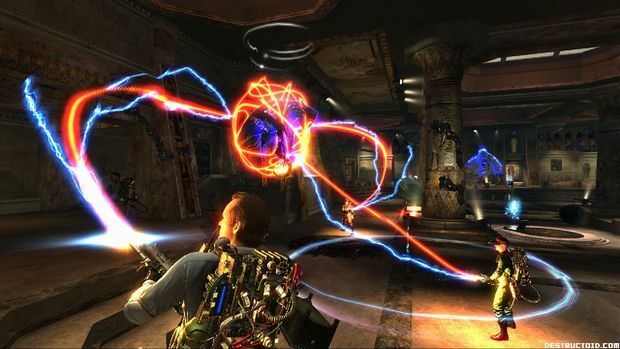 While it’s not going to replace Gears of War 2 or Call of Duty 4 as your multiplayer game of choice, it’s a blast wrangling ghosts with your friends in short, one-off bursts. 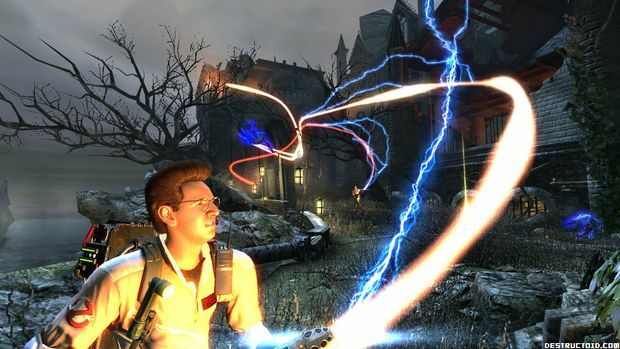 While it’s not the best third-person action game you’ll ever play, it’s certainly the best Ghostbusters experience ever committed to the format. For true fans of the series, picking up the game is a no-brainer. If you own the movies on DVD (or the recently released Blu-ray), Ghostbusters: The Video Game unquestionably deserves a spot on your shelf. Your collection wouldn’t be complete without it. So good, in fact, that I could have done with more of it. Throughout the first couple hours of Ghostbusters, that's pretty much all you'll be doing: finding, you know, actual ghosts, blasting them with the proton pack, and wrangling them into traps. The actual act of lassoing specters into a ghost trap while they try with all their might to break free of your grasp is way, way more satisfying than it has any right to be. This is partially because it so faithfully replicates the ghostbustin' process we've seen in the last two films (the act of capturing my first spirit caused me to spontaneously yell, “I am a goddamned Ghostbuster”), but also because the process of wearing a ghost down, slamming it against the walls and floor, and finally fighting tooth and nail to rope it into a trap is so full of elegant back-and-forth struggle that it feels completely new and interesting. Each of the three stages of ghost trapping can be potentially failed, but those failures don't set the player back very far. You might fail to get him into a trap, but a few slams later he'll be ready for another try. You might be just about ready to start slamming him into the walls, when a piece of possessed furniture hits your head and you're forced to blast him back down to minimum health again. Ghost capturing is challenging, but not frustrating; rewarding, but not needlessly simplified. It is, unquestionably, the best part of the game. Which makes it all the more frustrating that after the first few hours of the game, the mechanic is almost completely abandoned by the wayside. 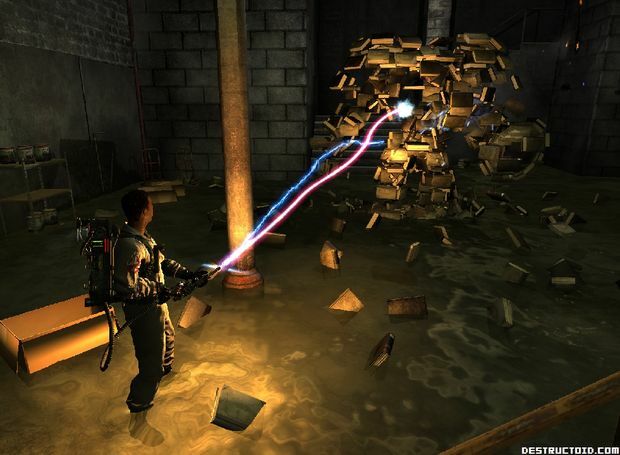 After an incredibly cool fight against the returned Stay Puft Marshmallow Man, the game starts doling out proton pack “upgrades” that essentially function, like inFAMOUS's lightning powers, as re-contextualized versions of old third-person shooter tropes. Egon may call them Shard Blasters or Slime Guns, but you and I know they're really just shotguns and flamethrowers. After your character, the Rookie, gets his first proton pack upgrade, the game goes...I don't want to say “downhill,” necessarily, but it definitely never again reaches the heights of the game's first few hours. The rest of Ghostbusters comprises a pretty decent third-person shooter, which is fine. I just couldn't help but wish they'd focused on the much-better-than-pretty-decent ghost wrangling mechanics and developed on those throughout the game's running time, rather than taking the easy way out and adding a bunch of new weapons in a misguided attempt to add depth. When you combine such a design decision with some horribly placed checkpoints, confusing level design and needlessly frustrating combat scenarios later on in the game, you've got the makings of an all-around mediocre licensed game. Which makes it all the more surprising that Ghostbusters is not a mediocre licensed game. Despite the generic third-person shooter gameplay, I felt sufficiently compelled to finish the game thanks primarily to the palpably Ghostbusters-esque atmosphere. Music from the films can be heard all throughout the game, the returning cast members do a great job (save for Bill Murray, but that may have more to do with the fact that Peter Venkman is written as an irritating, over-the-top parody of his former self), and while the basic plot isn't anything to phone home about, it's great to hear Winston's charming pragmatism and Egon's monotone irony replicated almost perfectly. The jokes are pretty hit-or-miss, especially those involving Venkman, but I found myself laughing far more than I'd anticipated once the other three Ghostbusters started bickering at one another. Though the frustrating checkpoints and “shoot reanimated corpses in the face with a proton shotgun” gameplay got pretty tired near the game's final act, they never felt as infuriating as they well could have thanks to the oft-entertaining interactions between the film characters, and the fact that I truly felt like a part of their universe. Faithfulness and immersion can go a long way in making one forgive outright stupid design decisions, and Ghostbusters proves it. Conrad will go into more detail about the game's multiplayer modes, but I just want to say a few quick things about them. Firstly, the multiplayer is to be congratulated, if nothing else, for implementing a mechanic based around crossing the proton streams. You're never really given a chance to cross 'em in the singleplayer campaign outside of a prerendered cut scene, which frustrated me intensely as a casual Ghostbusters fan. Being able to jump right into a multiplayer game and immediately cross the streams with another player for so long that my proton pack exploded and killed me was a perverse pleasure. Secondly, since the multiplayer is based entirely around cooperation, it honestly didn't feel that different from the single-player campaign to me. Sure, there's a competitive aspect that encourages players to race one another to nab more ghosts and get more money, but the weapon restrictions and limited ammo made me feel like I was just playing a less satisfying version of the singleplayer experience. In spite of itself, Ghostbusters manages to be one of the best licensed games I've played in a while. Its faithfulness to its source material allows it to overcome many of its structural flaws, and it still manages to provide a couple hours of truly original, immensely satisfying gameplay. Granted, those two hours are followed by about four more hours of unoriginal, often irritating gameplay, but if you have any love for the Ghostbusters franchise at all, you likely won't mind putting in the overtime. Ghostbusters' story is a whole lot of fan service. There is nothing wrong with that -- I'm a fan and I like to be serviced, after all -- but the game is absolutely crammed with reference to the first film. The plot revolves around many of the same personalities from that story, though some were merely referenced before. The fanboy in me rolled its eyes at a couple of points but it's a more than capable effort filled with charm and humor. Actually catching ghosts is a load of fun. All spirits show their energy level when you aim at them in the form of a wheel. As the wheel depletes due to your attacks, it will eventually turn red to signify that they can now be captured. Switching to the capture beam is as easy as pushing a button and you can then guide the ghost to an open trap, wrangling it in the whole way down. The process is a blast to perform, especially with chaos erupting around you. Smaller ghosts and spirits will dissipate on their own if damaged sufficiently and many enemies have quick and easy methods of dispatching them. It's fun and very intuitive, although some of the charm begins to wear thin in the latter fourth of the game as the game seems to take more cheap shots at you in the name of increasing the difficulty. 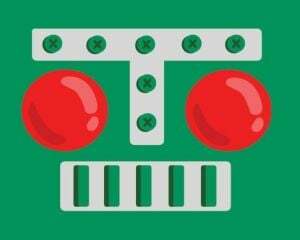 The eight modes of fire for the proton pack contribute greatly to the variety of combat. They all represent mainstays of the shooter genre, with a shotgun, rocket launcher and machine gun all getting their due. The slime thrower is an especially creative weapon in that its alternate fire creates elastic tethers of slime used to move objects, solve puzzles and really piss off ghosts. Teamwork is also an important aspect in encounters with the supernatural. 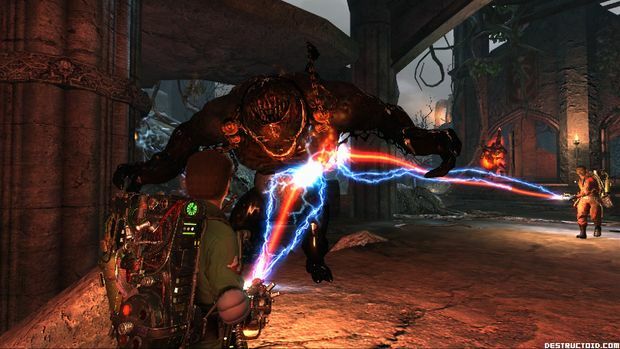 Throughout most of the game you will be traversing levels with at least one other Ghostbuster by your side. When you fall in combat, they'll run over and revive you, provided they aren't completely pinned down. Likewise, saving them is important both to have someone to keep you alive and as a way to draw attacks from other enemies. When it comes down to it, the Ghostbusters are not a very effective fighting force. You'll wind up doing the lion's share of ghost elimination throughout the campaign. This does have the effect of making them feel more like necessary crutches than actual partners during the gameplay, but their quips and commentary are well worth the occasional hassle of keeping them alive. Besides, you'll probably get knocked out quite a bit. The characters are pretty fragile in the face of unholy forces from beyond the grave. The game offers a dodge command, but its response time and the amount of movement it actually performs renders it pretty much useless against all but the slowest of enemies. Knowing your enemy helps quite a bit in combat and your PKE meter provides useful information. Scanning ghosts with it will reveal strengths and weaknesses to give you a better idea of how to take them out. It can be a little risky pulling it out in the middle of combat, as the animation leaves you vulnerable and you can't fire weapons while using the PKE meter. Still, it's well worth the effort to scan as many enemies as you can. In fact, learn to love your PKE meter, because you two are going to be best friends. It serves as a helpful guide on where to travel next, for starters. You'll also have to refer to it freqently to find hidden doorways. Plus, using it to hunt down and scan cursed artifacts will earn you money that can be spent upgrading your equipment. The idea is fun but gets played out after a few levels, where as much time is spent with your head in the meter as busting ghosts. The PKE meter serves another really important function in Ghostbusters. See, the films are always remembered for their wit, but the first film is actually pretty damn creepy in points. Similarly, the game works up some tense moments, particularly when the player is stuck in a first-person view without any weapons. Cheap shots? Certainly, but effective and entertaining. 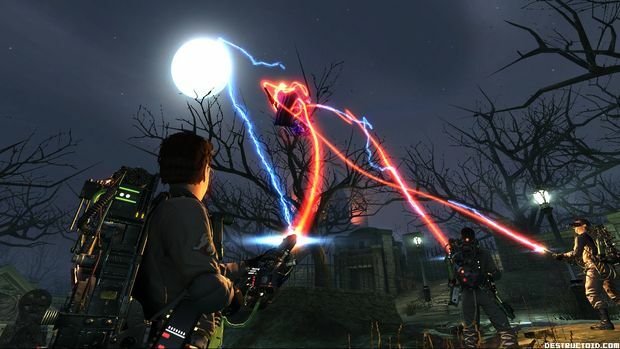 Alongside the single-player campaign, Ghostbusters has an online multiplayer component. These games are all a combination of cooperative and competitive play and there are quite a few modes available. They range from surviving wave after wave of ghosts, to defending relics and destroying ghost generators. Just as in the single-player, getting knocked down does not knock you out. Other players can revive you, or you'll simply get up on your own in about thirty seconds. The emphasis on teamwork is really strong, and all players being knocked out will prematurely end a mission. Trying to go it alone simply to score more points than your teammates will usually result in a swift death. Also of interest are the "Most Wanted Ghosts," a collection of special spooks found only in the multiplayer. By meeting specific criteria during a multiplayer game, these unique specters may manifest and give you an opportunity to catch them. While I'll probably never spend the requisite time in multiplayer to collect them, I can see it being an appealing challenge. It's all fun, but not something I can see being a long-term love affair. It's also a little baffling why cooperative multiplayer wasn't implemented for the main story campaign. The gameplay feels tailor-made to allow a group of friends to traverse it together, and it's disappointing that anybody bothered to do multiplayer in the first place without making a co-op campaign a priority. Ghostbusters winds up in an interesting position, being one of the finest games I've ever played based on a film property. It's a good title but not a staggeringly good one. The single-player campaign is entertaining for its eight- to ten-hour run but doesn't have a whole lot of replay value, making this a highly recommended rental.